Ho Chi Minh City makes Tokyo seem even more creepily quiet. The roads were packed with scooters and motorcycles. Everyone was honking at everyone to telling everyone else they were there and they were about to be where four other people were. You had to constantly dodge traffic at every intersection even when there was a stop light. We went to the market the first day in search of shorts for Cam. I'm not a fan of crowds so you can imagine how much I liked being in a crowd of people, walking down narrow aisles while avoiding the insistent calls of "Miss! Miss! What are you looking for miss?" I didn't want to stop anywhere in fear I would be descended upon by every sales person within 5 metres. At least Cam found shorts amongst the madness. Not wanting to go far, I stayed and was talked at by a woman who asked the usual questions of where we were from. After finding out that we were married she inquired if I was a mother and/or pregnant. Nope. In her defence she thought we had been married for longer than two months. Her current plans are for my reproductive uses to be utilised within two years and then busy with baby! No. Just no. After escaping the market we took advantage of the fact you can buy beer on the streets and enjoyed our walk. 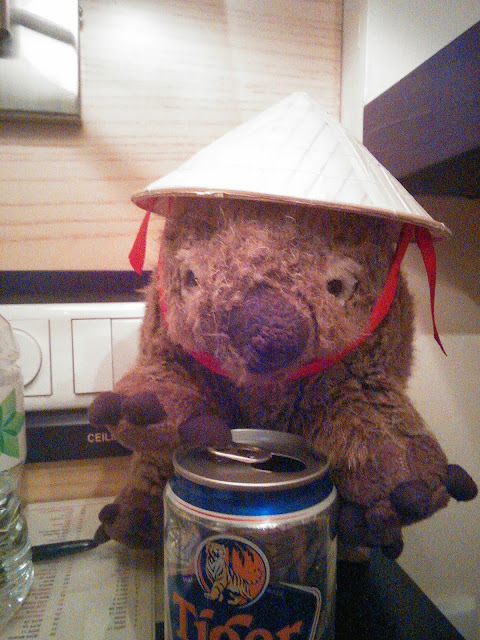 We came across a woman selling Vietnamese hats in various sizes and much to Wombie's excitement she had his size. It has since been agreed that he looks very darling in his hat.